Once your order has been placed, whether it be in stock or a custom design, Genest Precast will make every effort to meet your scheduling needs. Our highly-trained delivery crews will carefully install your selections with a special attention to detail. Should any minor adjustment be necessary and a follow-up visit be needed, our crew will return to service your installation in a timely fashion at no extra charge! Installation may vary depending upon site conditions. On site installation is approximately a two hour procedure. 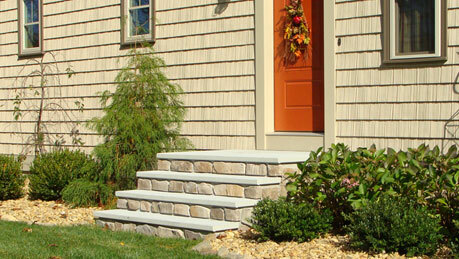 It is important to that the steps are installed with the proper foundation. The best support will be based on your individual site needs. Where a poured concrete foundation is not available on a site, precast concrete pads are installed in four locations to support the steps. Angle irons are affixed to a poured concrete foundation to support the steps from the rear while precast pads are installed to support the front of the steps. Large fabricated iron brackets are affixed to the foundation and the steps are installed on them in such a way to support the steps from both the front and rear. Angle brackets protect the installation from settling soil. There is an additional fee for these units. All surfaces are completely sealed with a deep penetrating, waterproof coating to help protect your steps from the effects of nature. Our products are covered by a five year warranty to be free of defects in material or workmanship. Please ask for details. 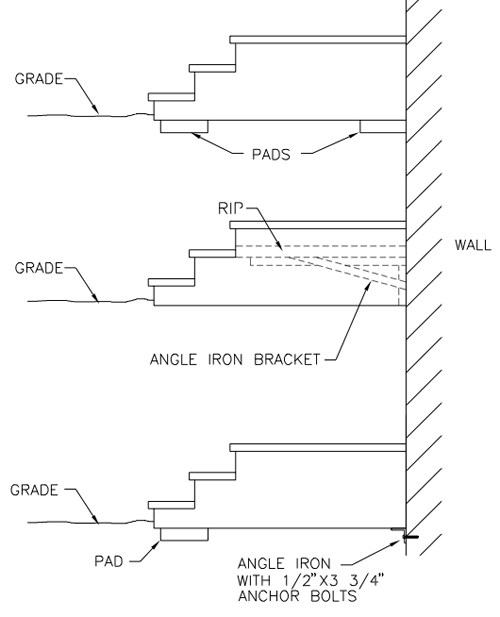 For engineering drawings of our steps, a diagram of attachment options, and a "How to Measure" drawing, please check our Engineering Drawings page by clicking here.